The Journal of Midwifery & Women's Health (JMWH) is the official journal of the American College of Nurse-Midwives. This peer-reviewed journal presents new research and current knowledge across a broad range of clinical and interdisciplinary topics including maternity care, gynecology, primary care for women and newborns, public health, health care policy, and global health. With a focus on evidence-based practice, JMWH is dedicated to improving the health care of women throughout their lifespan and promoting excellence in midwifery. ACNM members link (ACNM members, please log in to www.midwife.org first and then click here for full access to the online journal. 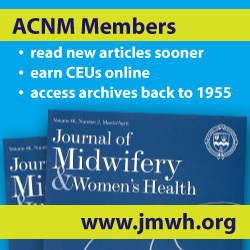 If you are not an ACNM member, please visit the Journal's Web site at www.jmwh.org. If you are interested in submitting a manuscript to JMWH, please visit www.jmwh.org to familiarize yourself with the Journal and the JMWH manuscript requirements. When you are ready to submit, please go to http://mc.manuscriptcentral.com/jmwh.